Die Mannschaft's captain calls time on his senior career for Germany after 12 years. 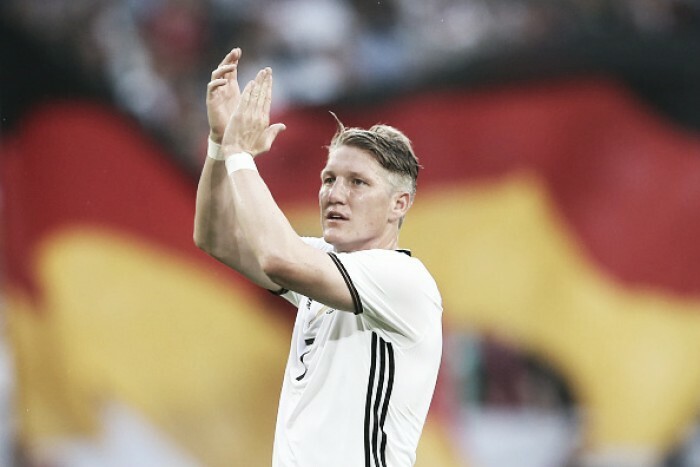 Bastian Schweinsteiger has announced his retirement from international football. The Germany captain hangs up his boots for Die Mannschaft after 12 illustrious years and retires as a World Champion for Joachim Löwe's side. In that time Schweinsteiger has amassed 120, scoring 24 goals. The 31 year-old's footballing odyssey through the German international youth system began in 2000 where at the age of 15, Schweinsteiger made a first appearance in the schwarz, rot and gold for the Germany U16 side. Progressing through to the U21 team four years later, Schweinsteiger was called up to Rudi Völler's Euro 2004 squad. Despite this Germany crashed out in the group stages. A part of Germany's World Cup 2006 squad on home soil, Schweinsteiger made a name for himself as a long-range specialist with two stunning strikes versus Portugal in the third-place play off. At the age of just 22, he had already represented his country 41 times - a record at that time. Schweinsteiger became one of the first names of Jogi Löwe's teamsheet through to Brazil 2014. Initially a substitute in their campaign, he came on against Ghana and was then selected to start as an instrumental part, en-route to Germany lifting the Jules Rimet Trophy two years ago. After being named captain in the lead-up to Euro 2016, Schweinsteiger's injury problems began to take their toll. Having already sustained a troublesome knee complaint for Bayern Munich, the German's switch to Manchester United in 2015 complicated matters further. The physicality of both the Premier League and Louis van Gaal's notorious training regime hit Schweinsteiger hard. He aggravated the knee once more training whilst away on international duty, causing him to miss the rest of the campaign. He did however take part in this summer's European Championships. Bastian Schweinsteiger's decision to hang up his international boots is surely one which the German will hope to prolong his domestic career.